The level bubbler functions by forcing a gas (compressed air) at a near constant flow rate out the bottom of an open tube (dip tube) submerged in liquid. The back pressure in this tube is measured. With the liquid’s density known, the level can be calculated using the back pressure and density. A pressure transmitter converts the back pressure to provide a 4-20ma output to a controller, which calculates the liquid’s level. In more detail, a compressed air source is supplied to a filter/regulator. The Filter/Regulator provides a filtered and reduced supply of air pressure to the constant flow controller. The controller maintains a near constant volumetric rate of flow set to 1SCFH, regardless of various process or supply pressures. This constant flow of compressed air flows through the flow controller through a rotameter (that displays the flow rate) to the dip tube. The hydrostatic back pressure of the dip tube is measured by the gauge pressure transmitter, which sends a 4-20ma signal. This signal can used to control a pump, sound alarms or can be sent to a programmable logic controller for further use in controlling functions of a process. The level bubbler can be used to monitor in-take screens for debris and initiate an airburst backwash. This is done by placing a dip tube on each side of the screen and when the pressure differential between the two reaches a certain point, a backwash can be initiated to clean the screens. This system is a called a Differential Level Bubbler. The level bubbler can be used to measure the level of the wet well to control the intake pumps. The level bubbler can be used to measure levels in all types of liquids such as sanitary waste stations. The level bubbler can be a retrofit replacement for ultrasonic level transmitters. The bubbler offers several advantages over other types of level and differential measuring devices. Immune to surface foam, pH, conductivity, temperature, turbulence, and solids content. Reliability is better than other level measurement methods because the dip tube is the only part of the system in contact with the liquid being measured. The sensor is not in direct contact with liquid, offering long life and greater calibration stability. Accuracy from 1% to 0.075%, factory calibrated traceable to NIST & ISO 17025. The instrument panel can be located up to several hundred feet from what is being measured. Suitable for applications with corrosive, acidic, hazardous, volatile, molten, cryogenic, or radioactive liquids. The purge gas (compressed air) provides complete isolation from the measured liquid. Minimal Maintenance when an Auto Blow Down system for the dip tube is purchased and integrated with the Level Bubbler. Righton Bubbler Systems are custom designed for continuous measurement and control of level and head loss. Since 1993 Righton Instrument Co. has been designing and manufacturing Level Bubbler Systems with a strict policy of Quality Assurance. Each component is carefully selected to produce a truly turnkey system. The bubbler method has proven to be the most reliable and respected by experienced operators. Our custom design and modular concept offers the technique at a lower cost and easier installation for the end user. LED readout for Level indication. Level (High and/or Low) Alarms. Heater and thermostat for outdoor panel location. Blow Down of Dip Tube – the practice of periodically injecting high pressure/velocity air through the bubble tube to remove buildup inside the tube. 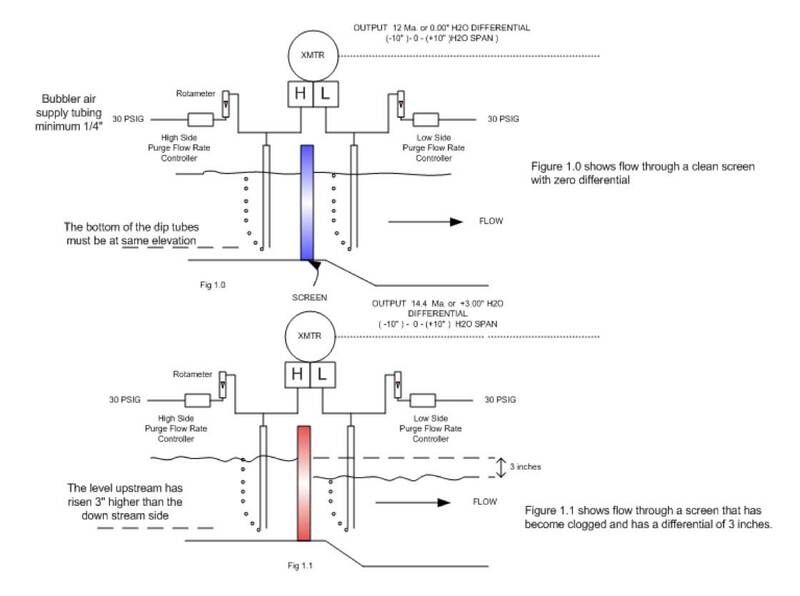 Manual initiation of dip tube blow down. Auto blow down of dip tube. Air compressor and tank for supplying the compressed air. Loss of compressed air Alarms.